Peggy Heaverlo has countless handmade rugs in her Estacada home. Heaverlo has been making them for 50 years. She was working for a manufacturing company and was given extra scraps of fabric, from which she made pillows, bedspreads and purses. One day, her mother suggested that she braid rugs. "It's a hobby that's become a business," she said, estimating that she's created more than 2,000 rugs. "It's been rug after rug after rug." Heaverlo described braiding them as similar to braiding hair. "It's just repetition," she added. After the braids are complete, Heaverlo laces them together in a process similar to sewing. Each rug takes a different length of time to complete. "Some take three months and others take a day," she said. Heaverlo works with a variety of materials, and her favorite is wool. In addition to traditional fabrics, she's also made rugs from old lumber moving belts from a Weyerhaeuser facility in Longview, Wash.
"I dyed them different colors and braided them into a rug," she said. She also enjoys creating rugs in different shapes. "I can make hearts, dog bones, fish and ladybugs," she said. For many years, Heaverlo sold her work at the Victorian Country Christmas in Puyallup, Wash.
She often had as many as 125 pieces and typically sold all of them. Heaverlo's rugs have made their way to many locations, including Philip Foster Farm in Eagle Creek and the Mazama Lodge in Government Camp. She's often created pieces for auctions at Philip Foster Farm, as well. Her work has also been honored at the Springwater Fair. Though she plans to move soon to be closer to family, Heaverlo has taught classes from her Estacada home that focus on aspects of rug making. She said there's a special element to receiving a handmade rug, which is one reason she's enjoyed the craft all these years. 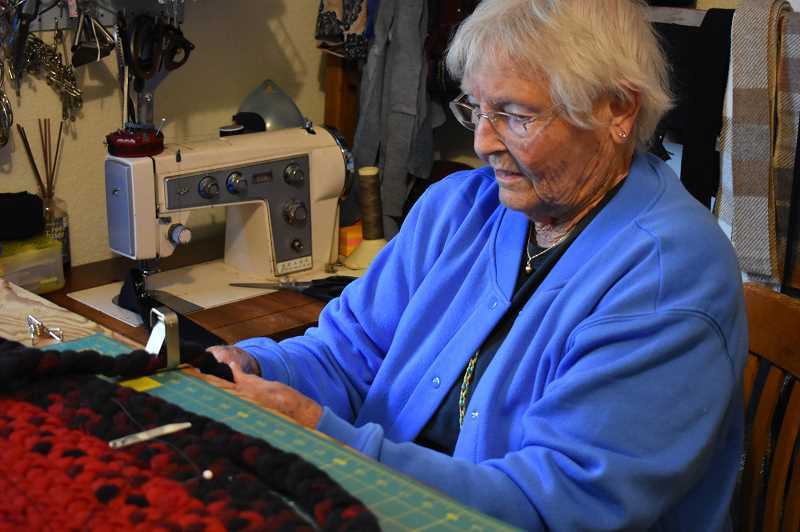 "What I do when someone buys a rug, after I tie it up, I hold it in my arms and say, 'I hope you enjoy this as much as I've enjoyed making it," she explained. "I've blessed every rug I've ever sold."